Welcome! 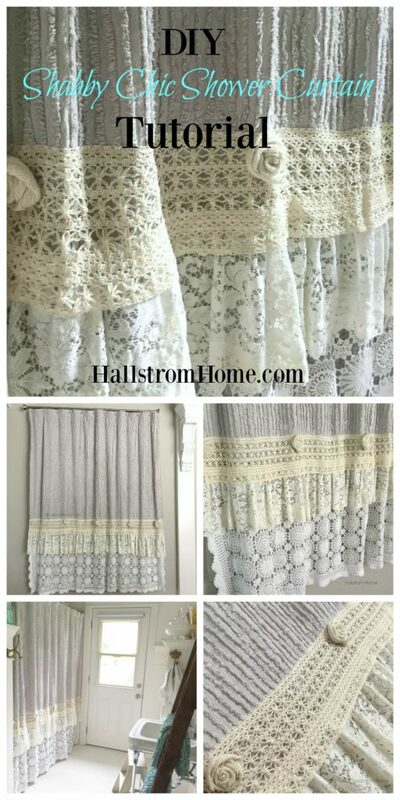 I thought I would share my DIY Shabby Chic Shower Curtain Tutorial with you. 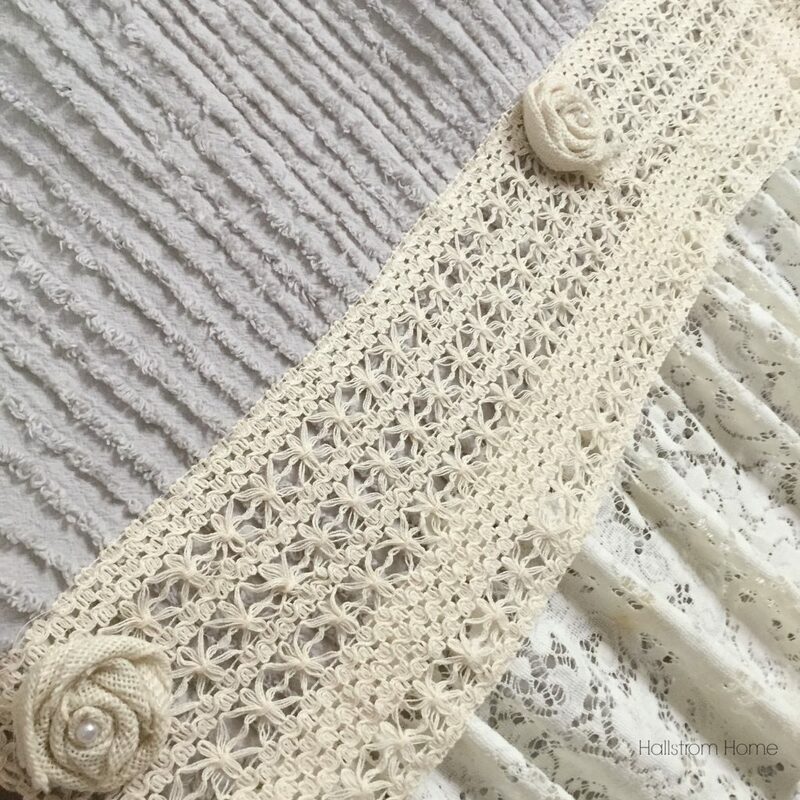 This is really easy to create in an extra long length with just a few details. I sell shower curtains in my shop, but some people really like to make it their own! This is a new sew shower curtain! It is optional to sew, but no need to! Finding the first piece to work with is important. Deciding on a crochet tablecloth was easy. I use a spray glue to hold my lace in place instead of straight pins. Then I sew my first layer of lace onto the base. Repeat layers until you’ve reached your desired effect. 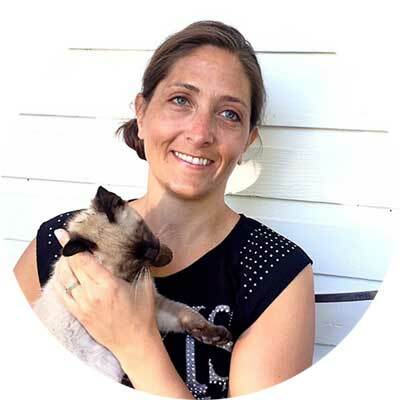 I will include some affiliate links, so you can see what products I use. You can just use hot glue if you don’t want to sew, I would personally recommend sewing though. How to make a shower curtain is quite simple! Applying burlap rosettes adds more shabby charm to the shower curtain. Learn how to make your own burlap rosettes in our tutorial. To make your DIY Shabby Chic Shower Curtain extra long. I attach the lace farther down the curtain panel. Often, I make my shower curtains at 84 inches long. So if you’re going to sew you shower curtain, I use the spray adhesive below, then sew. If you don’t want to sew, I would hot glue your fabric down. I included the hot glue gun I personally use. When remodeling our farmhouse bathroom, we used these hexagon tiles. Included with heated floors, which I highly recommend! Thank you for stopping by! Please let me know if you have any questions in the comment section below. How much is the one in your shop? I don’t have this exact one anymore, but I do have similar ones if you clock on the link below. 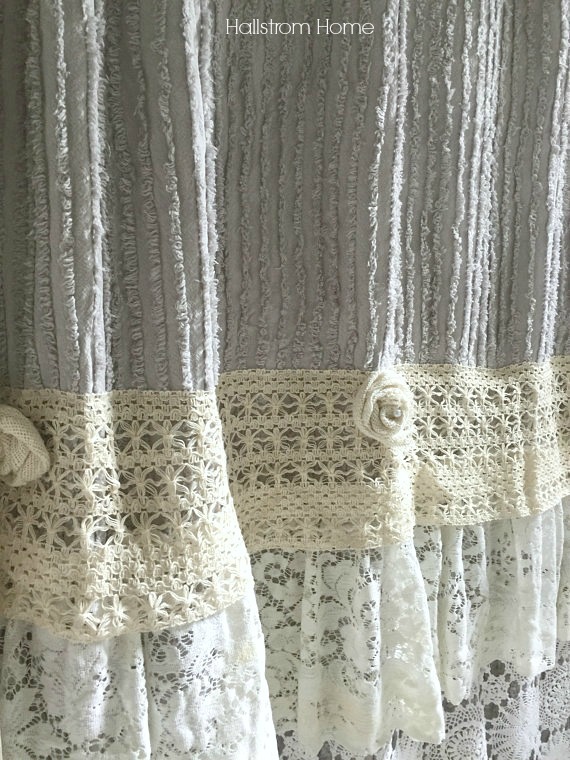 Did you buy the chenille shower curtain and then add the lace, etc? Or did you make the chenille curtain? What kind of materi is the shower curtain. Or what do you call the fluff stuff? 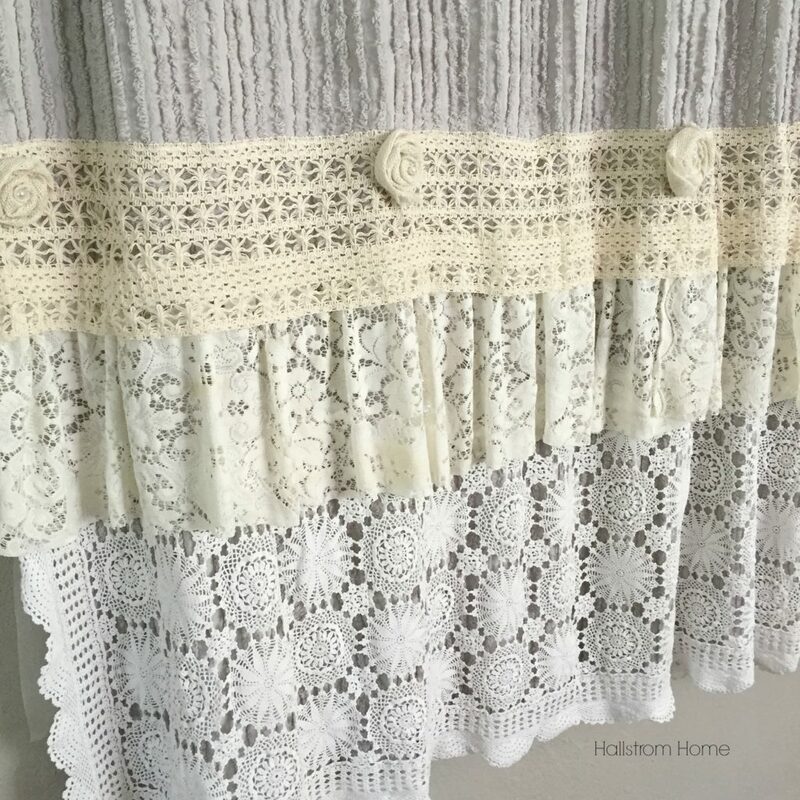 I used Lace to give this shower curtain more fluff and detail. I was wondering if could ask you were you buy your linen from. Wanting to make a shower curtain. I can’t find any at local shops and I never ordered from ONline shops. Your work is beautiful. I wish Ihad your talent. Thanks for your help!!! I wouldn’t hesitate buying online. I am an avid online shopper now, and I find it so convenient. If you’re looking for a local store, I’m sure any home goods store or a fabric store would have linens. Maybe Bed Bath & Beyond? Thanks so much for stopping by! I appreciate the kind compliment. Just gorgeous, rhonda! I might make something simiLar for our upstairs/guest/my daughter’s bAthroom because i cant find what i want in The colors i need. One question, though. How do you attach it to the rod? Drapery rings or do you put grommEts on the toP? Thanks for asking. I use drapery rings to hang my shower curtains.